RTI Routing Service is an out-of-the-box solution that allows developers to rapidly scale and integrate real-time systems that are disparate or geographically dispersed. 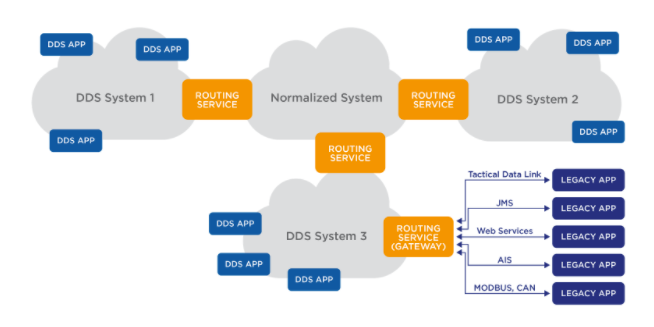 Routing Service can be used to bridge DDS applications across different domains to support a systems-of-systems architecture, interoperate new and legacy applications to support new product deployment while maintaining previous generation products or to integrate independently-developed systems for progressive system upgrades. The Routing Service Adapter SDK allows you to build gateways for integrating Connext DDS with other connectivity technologies. The Adapter SDK enables you to bridge multiple networks and topologies, and to form more complex topologies, as needed; truly realizing the vision of Industrial Internet of Things (IIoT). Routing Service can integrate systems-of-systems by decoupling topic and type definitions from external interfaces and bridging legacy messaging and networking technologies. For assistance developing complex solutions to integrate legacy applications and improve data security, please contact RTI Professional Services.